The physical properties of any soil are critical to its productivity. They include porosity, permeability, compaction, crusting. and texture. Some physical properties are inherent to the soil, while others can be modified by tillage, organic matter, plant root growth, and soil microbes. The categories below will explore different aspects of the physical properties of soils, how they can be modified, and how a “goldilocks” soil might be defined. When combined with a soil test, and a set of soil type maps, a very handy and intuitive visual tool for evaluating the strengths and limitations of any soil. Porosity (quantity of void spaces in the soil) – How much water can a soil hold? How much air? 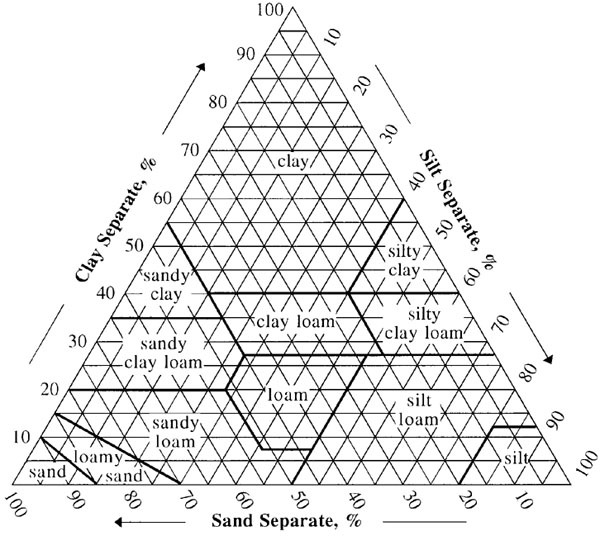 The answer to these questions is very important to determining the potential holding (storage) capacity of a soil. Permeability (how well void spaces in the soil are connected) – How fast does water move through the soil? How easily does air enter and leave the soil? The answer to these questions is very important to determining the potential productivity (health, resilience) of a soil. Together these soil characteristics create the framework we must work within to improve our agronomic efficiency. We can improve them slowly or we can destroy them – quickly or slowly. Soil texture is an inherent and important property of a soil. It influences CEC, permeability, and soil structure. But no matter what your soil texture is, it can be improved by organic matter and soil life. Organic matter attracts and supports micro-organisms and macro-organisms which in turn create soil structure through their exudates (poop). 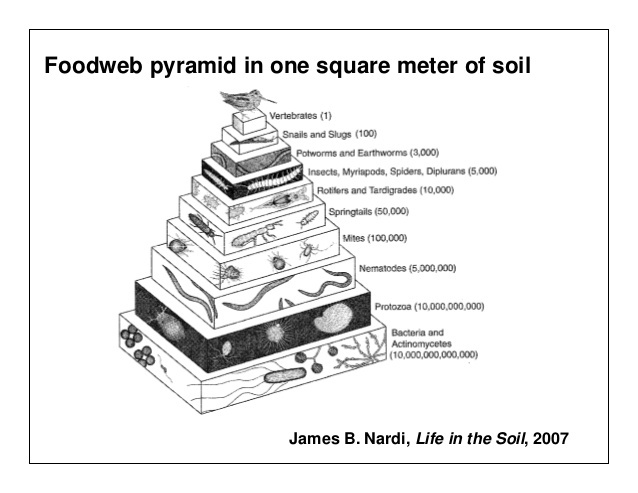 This texture/structure relationship is part soil foodweb, part soil physics, and part soil chemistry. Plant roots are the cheapest, easiest way to get organic matter in the soil and they benefit greatly from the result. There is soil and there is dirt. Soil is alive and dirt is dead (or dying). A deep soil indicates the ability to support life to a greater depth than average. This requires a very firmly and “completely” aggregated soil which allows air(oxygen) flow to the deeper portions. Compaction in soils is the opposite of aggregation. A compacted soil is a dead or dying soil – cut off from the supply of oxygen. The same processes that build soil organic matter and soil life prevent and minimize soil erosion.